The lead singer of chart-topping rock band The View has been fined £1,000 for possessing cocaine. 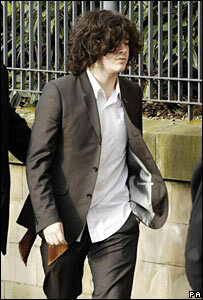 Kyle Falconer's conviction will make it "next to impossible" for the group to tour the US, his solicitor said. At Dundee Sheriff Court, the 19-year-old admitted possessing the class A drug after he was arrested outside a city student union. 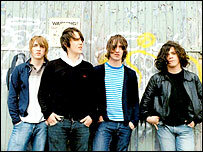 The Dundee band, which has received an NME award, debuted at the top of the UK album charts earlier this year. Falconer was arrested in the early hours after his group performed at Abertay University last August. He admitted to police officers that he was in possession of the cocaine, which had a street value of £150. Defence agent Billy Boyle told the court that Falconer had been handed the drug by music industry insiders who had been at that evening gig. Mr Boyle, who said the singer had not taken any of the substance, asked for an absolute discharge, as a conviction would make it hard for the singer to get a visa to tour North America. He added that The View had turned down £1m for a jeans commercial and the launch of the band's hit album, Hats Off To The Buskers, had already been delayed in the US. However, Sheriff Paul Arthurson told Falconer it was "simply not realistic" to consider an absolute discharge, which would have meant that after six months he would not have to declare his conviction. He told the singer, who declined to comment as he left court: "If you are in the public eye you have certain responsibilities and I ask you to bear that in mind in future." When the charge was pending, Falconer and band mates Steve Morrison, 19, Keiren Webster, 20, and Pete Reilly, also 20, had to cancel an eight-date tour which should have started in New York this month.